On a quiet street in the Sicilian mountain town of Castelbuono there’s a tall stone house that looks like all the others on Via Mangano. Inside, though, a very different life unfolds. Fourteen African teenagers, under the watch of government-paid caretakers and counselors, live in a parallel world. These boys are Castelbuono’s refugee and migrant children who are now part of the town’s daily fabric. They show up for classes at its schools, play football at the sport complex and hang out in the town center on weekends. What is happening in this out-of-the-way medieval town is subtly sculpting the future of not only these boys but also that of Europe. 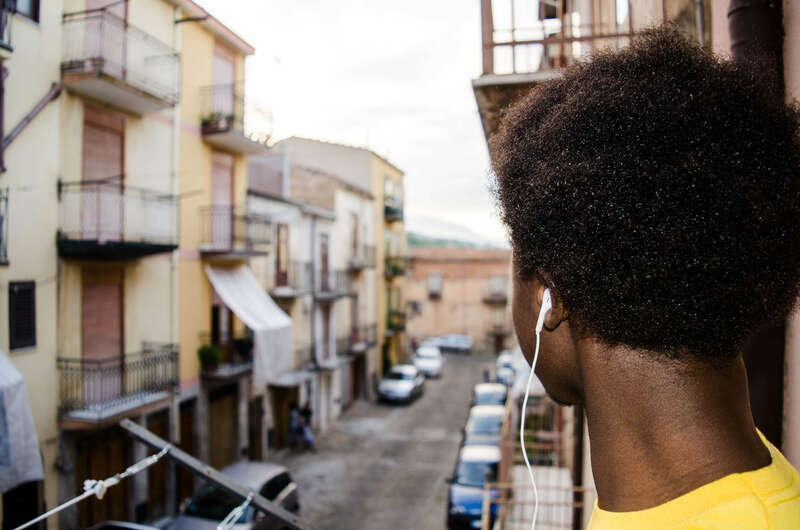 Inside the walls of this anonymous house, Italy is experimenting with turning wayfaring African children into future European citizens. By law, minors who show up in Italy are handled differently from adults and given sanctuary and tutoring until they are 18. That’s the role places like Castelbuono are filling. The hope is that these African youths can find jobs when they turn 18 and get work permits to remain in Italy. They arrive in Sicily without parents, often without passports, with only a few possessions and bearing injuries suffered on their odyssey to Europe. 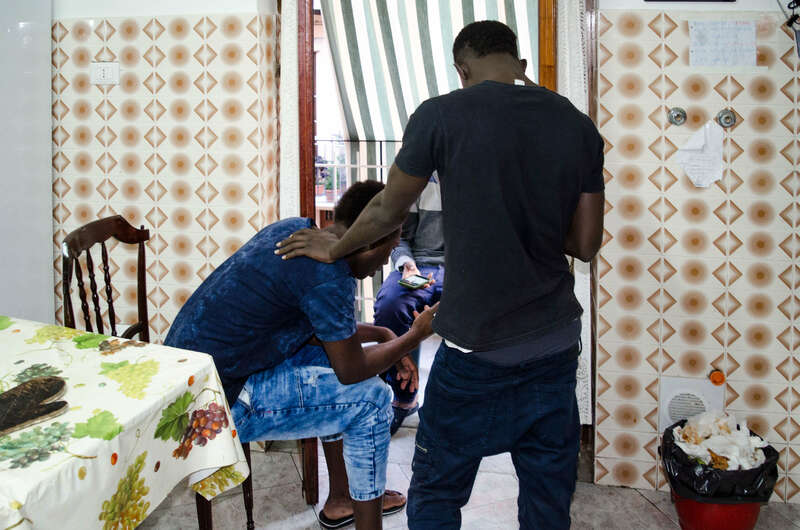 There are about 5000 refugee and migrant minors in Sicily spread out in dozens of similar houses and larger facilities known as centri di accoglienza, or hospitality centers. Sicily has the highest number of unaccompanied minors in Italy, according to officials. On the whole Sicily is welcoming to those fleeing broken nations. It may have to do with the island’s history. For instance, Sicilians often say they are proud to have Arab and African ancestry. The island also has its own experience with mass migration due to poverty and conflict. “Maybe it’s our culture,” says Santi Lo Re, an educator at Gabbiani. “Half of Castelbuono left after the war,” he adds, referring to large-scale migration after World War II. Nonetheless there have been instances of intolerance, as in the wealthy tourist town of Taormina and in Porto Empedocle where residents have spoken out against hosting refugees and migrants. At Gabbiani, the day starts early. With the sun barely risen, the boys wake for morning prayer. They hail from Muslim countries and pray several times a day. They sleep three to four in a room and pray next to their beds. Then it’s off to school after breakfast. Several children go to middle school while one older resident attends an agrarian academy. Others go to evening classes, mostly to learn Italian. L, a 16-year-old son of a tailor from the small impoverished West African nation of Gambia, says he did not go to school in his native country and he did not know how to write when he arrived in Sicily in May 2016. He can now. He, like others, says he feels no nostalgia for his homeland and that he wants to remain in Europe. He hopes to find work once he is 18. D, a fellow 16-year-old Gambian, says he left because of problems with his father. He says his father used to beat him and forced him to eat outside. Ferrauto says many boys flee Africa because they are unwanted children whose fathers practice polygamy. “I want to stay here in Castelbuono,” D says. He aspires to become an electrician. He is eager to go to school and improve his Italian. He is expected to begin very soon. For him, life in Castelbuono is far better than what he has been through. He rolls up a sleeve to show scars from when he says he was beaten in a Libyan prison for being an immigrant. In faltering English and Italian, he speaks of his traumatic past: seeing a boy killed in the Libyan prison after he tried to escape confinement; the hardships he endured during three attempts to cross the Mediterranean; watching people drown when their vessel capsized; days of boredom and frustration in another center before he landed in Castelbuono. To house, feed and tutor the minors, the Gabbiani center gets funding from the town, which receives funds from the regional and national government. It hasn’t been easy. This center and others in Sicily have recently gone for months without being funded, according to Ferrauto and other news reports. Roberto Carmina, a lawyer at the Associazione Asante Onlus, a non-profit that runs two centers for minors in Palermo, says the number of refugee and migrant children outstrips the network of facilities. Funding problems have forced some centers to close their doors. At the Asante centers, besides basic schooling, youths can learn to become barbers and restaurant workers. The Italians who run the centers in Castelbuono say they see their work as turning the African boys into good citizens and adults who can also cook and look after themselves. As evening falls, the smells of cooked rice and chicken basted in a spicy sauce fill the communal kitchen area. Songs from Mali float through the air, played on a smartphone. Most of the teenagers are in their rooms, glued to their ubiquitous phones. There is wi-fi inside the center and the boys are consumed with their devices, listening to music, playing games and engaged on social media sites. That’s the call to dinner. Within moments, the long table is filled with beaming faces as the boys devour the food on their plates filled with the aroma of Africa and speak a mishmash of African languages and Italian. As quickly as they showed up, they depart after washing their dishes and utensils, returning to their rooms, their smartphones and their individual worlds.